Ahead of the draw for Euro 2016 on Saturday, we look back 20 years to when Birmingham hosted the draw for Euro ’96. For England, there had been a long wait for the tournament but now the excitement could finally build as they were paired with their oldest rivals – Scotland. December is often a bit of a dead month in international football, but the last month of 1995 proved anything but for England and boss Terry Venables. A week in mid-December was full of international happenings. On Tuesday, December 12, the qualifying draw for the 1998 World Cup placed England in a group including Italy. That night, Steve Stone scored as they drew 1-1 with Portugal in a rare December friendly. The following evening, Anfield staged the only qualifying play-off for Euro ’96 as the Netherlands turned on the style in beating the Republic of Ireland 2-0 – a result that would almost certainly spell the end of Jack Charlton’s reign with Ireland. On Saturday, December 16, Venables suffered a blow as left-back Graeme Le Saux was carried off playing for Blackburn Rovers against Middlesbrough with an injury that would rule him out of Euro ’96. And behind the scenes, Venables was left deciding that he would be moving on after the tournament amid a series of legal battles (the announcement would be made the following month). 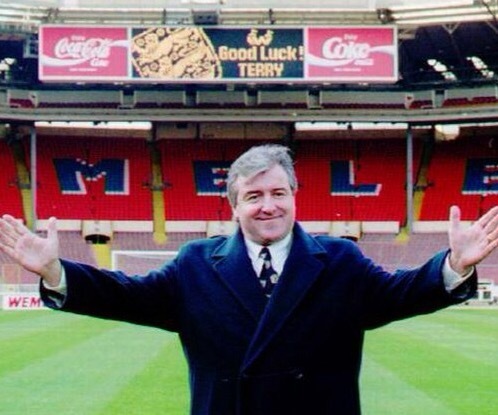 Euro ’96 would mark the end of Terry Venables’ England reign. But Venables would be spending the next six months carrying on doing what he had been for almost two years – preparing England for Euro ’96. It had been a long wait, England having not played any competitive football – if one discounts the Umbro Cup mini-tournament – during his reign as one friendly merged into another. But eight days before Christmas, the draw for Euro ’96 was to take place at Birmingham’s International Convention Centre. At last the tournament and what Venables had been working towards was starting to seem real. There’s something quite enjoyable about the draw for major tournaments taking place shortly before the festive season, with the Christmas tree up as you settle down to watch it. In much the same way that the holiday guide in the Christmas edition of the Radio Times provides a good chance for readers to start planning for the following summer, the draws for major tournaments do the same for England fans – as they either start making arrangements to attend the matches or plan for where and when to watch them on TV. 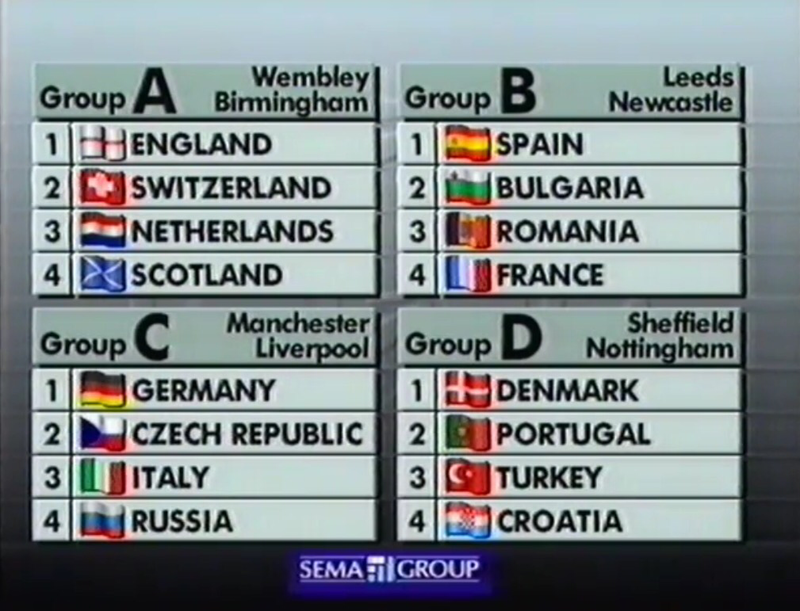 How the Euro ’96 draw panned out. As if to convey the significance of the draw, both the BBC and ITV showed it live on the Sunday afternoon with Sue Barker and Bob Wilson jointly introducing proceedings for viewers across the continent. Some international draws can be ridiculously long and do not flow, seeming more of a cultural event than the simple procedure of determining who plays who the following summer. The draw for Euro ’96 was not without such accusations, as the coaches and media sat through English schoolchildren welcoming each participating nation and Mick Hucknall performing. But mercifully as this draw was largely free of seedings it flowed far better than many have. England were joined as a seed by Germany, Spain and holders Denmark and the other 12 sides were not seeded – there were no second tier seeds etc. This made it hard to guess just what sort of group England might end up with, the worst case scenario being something like Italy, the Netherlands and Portugal all joining them. As a seed, England would be one of the final balls drawn out. Eventually all that was left was England and Germany, to go in either a group with the Netherlands, Scotland and Switzerland or Italy, the Czech Republic and Russia. The former option was probably the slightly more preferable to Venables and the chances of a clash with Scotland now stood at 50-50. BBC commentator Barry Davies seemed to suddenly morph into his statistically-obsessed rival John Motson as he dwelt on the possibility of the old rivals clashing again. “107 meetings they’ve had England and Scotland. 43-40 it stands in England’s favour. Are we to have another one?” he asked as the piece of paper was pulled out of the ball. “Yes we are,” he exclaimed as England’s name popped up on the screen. England and Scotland were to meet for the first time since 1989, when Steve Bull scored on his debut. Venables was seen performing the customary chuckle response to an intriguing draw, as the rest of the proceedings were lost amid the anticipation in the room of England taking on the Scots. Ally McCoist, joining Des Lynam and Gary Lineker in the BBC studio, was preparing for six months of pre-match banter with Rangers colleague Paul Gascoigne about the tie. It would have been exciting enough for England to be paired with the Scots regardless, but the fact they had not met since 1989 following the demise of the Rous Cup meant it was particularly appealing. It would also be the first time England had met a fellow British side at a major tournament (but not the first meeting with another British Isles nation after playing the Republic of Ireland at Euro ’88 and Italia ’90). Each England group game had its own attraction. Switzerland – who Roy Hodgson had steered to the finals before moving on – were the least enticing of the three fixtures but they would play them in the tournament’s opening match. The Scots would be up next for the match that would inevitably be dubbed the ‘Battle of Britain’. And the group would conclude with a clash with the Dutch, much-hyped after the play-off win over the Irish but with England having a score to settle after their opponents had qualified for the 1994 World Cup at their expense. 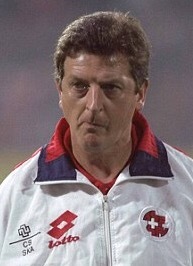 England were to face Switzerland at Euro ’96 – but not Roy Hodgson. Not all the newspaper talk about England playing Scotland focused on the positives, with some fears raised about the threat of trouble. However, both Kirton and Scotland manager Craig Brown played down the likelihood of hooliganism. Meanwhile, Venables was being quizzed about playing the Dutch, who had looked so impressive against the Irish. “They currently have an outstanding team,” he said. “But we have confidence to play against them. I don’t fear sides because fear in itself then becomes your greatest obstacle. We knew that whatever group we were in it was going to be exciting because of the high quality. To play against Scotland and Holland makes it doubly exciting.” Opposite number Guus Hiddink was playing down Dutch chances despite now being installed as favourites by some bookmakers, reminding the media they had “qualified by the kitchen door”. Although most of the talk after the draw concerned England’s group, there were some interesting looking fixtures in store elsewhere. Group B contained the two sides who met in the Euro ’84 final – France and Spain – as well as Bulgaria and Romania who had both done well at the 1994 World Cup. Group C provided a match-up between two of the favourites in Germany and Italy, although their Old Trafford clash could potentially be about nothing more than who topped the group if they both took care of the Czech Republic and Russia. Group D looked arguably the weakest of the other three groups, with Denmark – not expected to repeat their 1992 heroics – being joined by a re-emerging Portugal side and the unknown quantities of Croatia and Turkey.